These voltage output transducers will provide a linear signal of a few volts that is directly proportional to a specified vacuum range. Use these vacuum pressure transducers to measure over a portion of the vacuum range such as 0 to 500 mbar absolute or over the whole vacuum range such as 0 to -15 psi gauge. 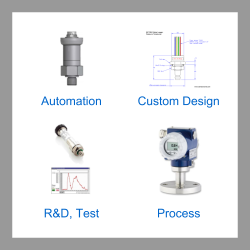 Depending on your application preference many of these transducers can be specified to measure vacuum either as a positive absolute pressure or a negative gauge pressure. Vacuum range pressure transducers with 5 or 10 volt full range output signals for measuring partial vacuums of a few mbar or full vacuums up to minus 1 bar (-15 psi). Send us your enquiry for Vacuum Pressure Transducers to get assistance with this product type.